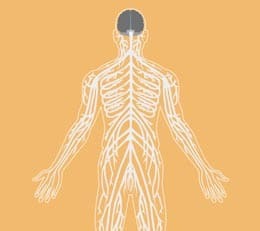 The peripheral nervous system includes every nerve that supplies muscles or the skin. Peripheral nerves control the motion of muscles and transmit signals about pain, temperature and touching or be touched from the skin to the brain. They can be affected by a variety of disorders and injuries. Depending on the kind of disorder or injury, pain, numbness or paralysis can occur within the area of muscles or skin the corresponding peripheral nerve innervates.